You probably know about tile mosaics, but you might not know that you can achieve a similar effect with fabric. Indulge your love of brightly colored fabric and bold patterns, while adding to your home's decor by creating a fabric mosaic picture. Piece together fabric shapes on your canvas to create a picture of something real, such as a sunrise or a piece of fruit, or of nothing more than a random arrangement of random shapes and colors. Measure the height and width of your canvas. Cut a piece of paper with the same dimensions. Lay the paper on your work surface oriented the same way you want the canvas oriented on your wall. Draw the picture you want to create with fabric on the piece of paper. Simple pictures composed of shapes 1-inch square or larger work best. Cut out all the different pieces of the picture with a craft knife. Trace all the paper pieces on the wrong side of different pieces of fabric. For example, trace a sky background on the back of a blue piece of fabric, grass on green fabric and the Sun on yellow fabric. Cut out all the different fabric pieces. Place one piece of fabric on your canvas at a time. Start with pieces that go along the edges to ensure all the pieces fit together on the canvas correctly. Stitch the pieces on the canvas with needle and thread using a running stitch -- a simple back and forth stitch a 1/4-inch stitch length -- along the perimeter of each piece. You can use a different color of thread for each piece, so the thread is almost invisible, or a single color of thread for all the pieces. Use spray adhesive to adhere the fabric pieces to the canvas before you sew them in place if you are having trouble getting the fabric to stay in place as you sew. Keep an adhesive residue cleaner, such as Goo Gone, handy if you do use spray adhesive, because it will gunk up your needle over time. If you have a background composed predominantly of one color, paint the canvas that color so thin, white lines don't show through between the fabric pieces. 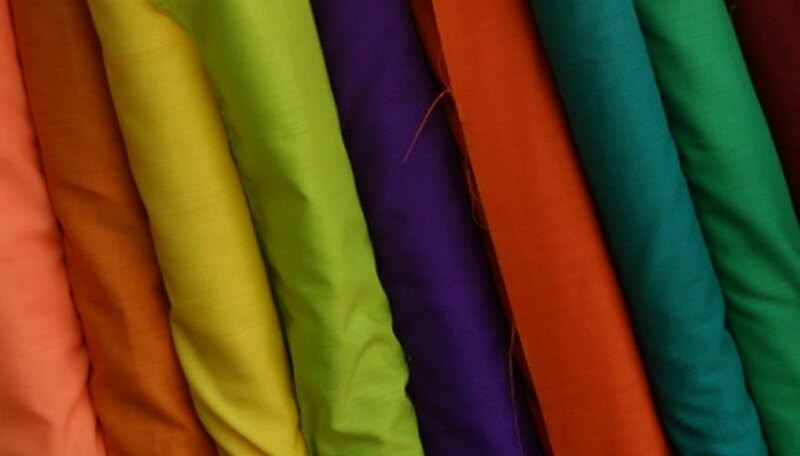 You can use solid-colored fabric, prints or a combination of the two to create your fabric picture. Always keep your hands out of the path of a craft knife when cutting in case the blade slips. Make all cuts with the craft knife on a cutting surface, such as a work bench, cutting mat or cutting board so you don't scratch a nice table.